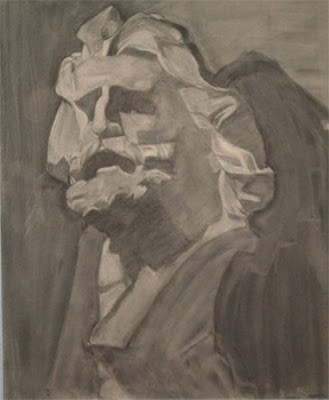 This is a drawing of a cast of Moses and he is quite large. We used a full sheet of paper instead of our previous half sheets. That uses quite a bit of charcoal. I am still using my homemade charcoal here and, if the weather will cooperate, I hope to perfect it as it isn't quite up to the standard I was used to in drawing charcoal. I went absolutely backward one day and my drawing got quite out of control. A few sweaty hours later I had managed to gain the upper hand, barely. It was a huge learning experience and one that makes me grateful I have a skilled teacher to give me a boost. Considering this is my first year in school, I am quite please with how close the likeness was. You will have to take my word for it as I will not be taking pictures of the live models to post. 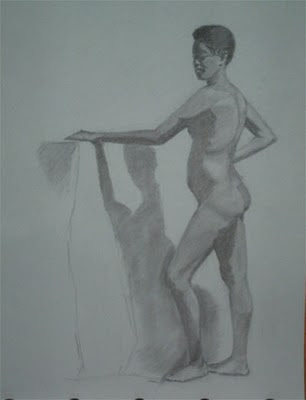 I really like figure drawing even more than I though I would. There is just something about working with a live person that adds an extra element to the creation. It also adds difficulty as the model moves, a lot. I am learning to deal with that too. The paradigm shift? That was the words the master teacher used when telling me how my work was coming along. I have definitely noticed a difference in my work and how much I understand. I am not sure that I have had a paradigm shift as it seems like quite a strong statement. I do know my level of understanding has increased. Perhaps it is one of those things that a teacher can see better than the student. In any case, I am grateful for the learning and also humbled by just how much there is yet to learn. I certainly won't be able to learn everything in a year or two. That leads me to my future. We have a place to rent in Manzanita and are very excited about it. We will be moving our belongings up north starting in July. It will be nice to escape the heat once a month and spend a long weekend at the cooler coast. Of course, the heat hasn't made it here yet but I know it will come. I will be posting pictures of our new town now and again. I also have been making plans to continue my studies. That will be a topic for another post in the near future. We will be starting a new drawing, or maybe even painting (I hope) next week and have already started a new figure drawing. Less than a month to go until our two week break! That looks like a ridiculously hard thing to draw (the cast of Moses). Yipes! Cool that you like your figure drawing class so much! Glad you've figured out some next steps as far as where to live and how to continue your studies. Can't wait to see pics of your new locale!! Your break must be coming up pretty soon!! Enjoy! Pain Can Be a Good Teacher....Uh Huh!